For the amiibo brand of gear in Splatoon, see amiibo (brand). amiibo are figurines produced by Nintendo that are equipped with Near-Field Communication (NFC) technology and can be used in a variety of Nintendo Switch, Wii U and Nintendo 3DS games, including Splatoon and Splatoon 2. 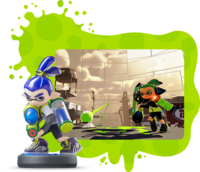 On 1 April 2015, Nintendo announced in a Nintendo Direct that Splatoon would be receiving three different amiibo on 29 May 2015. These amiibo, when scanned in Inkopolis Plaza, unlock twenty different challenges with five unlockable boss challenges in Octo Valley and new exclusive gear to wear into battle. The three amiibo that were announced were the Inkling Girl, Inkling Boy, and Inkling Squid, with the Squid only available as part of the three-pack in North America, and in Europe exclusively in a Splatoon + Inkling Squid amiibo bundle. Over a year later, a second wave of figures was announced, including the Squid Sisters, Callie and Marie, and recolored versions of the three amiibo from the previous wave. The amiibo case is located at the southeastern corner of Inkopolis Plaza and it appears as the packaging that amiibo traditionally come in. When scanning an amiibo (if the amiibo is registered) a flurry of paint circles the inside as the corresponding amiibo forms inside of it. The character introduces themselves and lays down guidelines for their challenges. Each Wave 1 amiibo features twenty challenges if the single-player mode, Octo Valley, has been completed. The first challenge gives the player 600 cash as a reward, with the reward increasing by 100 for each challenge cleared. Each challenge can be completed again, though for only a reward of 100 cash. When three challenges in the same row are completed, the fourth challenge for that set is unlocked, being the boss for its corresponding area in Octo Valley. As opposed to a monetary reward, the boss challenges provide an exclusive piece of gear for the first three bosses, a minigame for the fourth, and a weapon blueprint for the final boss. The Squid Sisters amiibo allow the user to view concerts in the Plaza, similar to a Splatfest. The three reskined amiibo have the same behavior as their original counterparts. The challenge trees are shared between the original and reskinned amiibo. 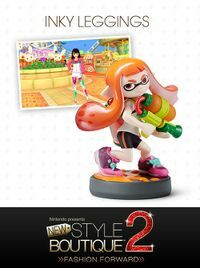 The Inkling Girl amiibo was released on 29 May 2015 alongside Splatoon. It can be used to unlock twenty Charger challenges in Octo Valley and rewards the player with an exclusive costume piece for every four challenges completed. 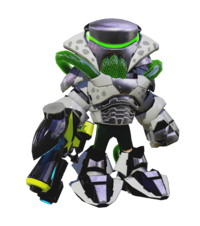 After completing all challenges, the player completes the set and receives the exclusive School Gear along with the Squidball minigame and the Hero Charger Replica blueprints. It can be purchased individually or in a pack of three with the Inkling Boy and Inkling Squid amiibo in North America. 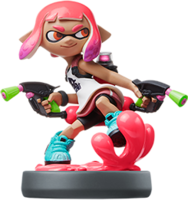 The original Inkling Girl amiibo is a light-skinned (the third from the left skin tone in Splatoon 2) Inkling with orange tentacles and orange eyes. She wears the Fake Contacts, White Tee, and Pink Trainers and carries the Splattershot. 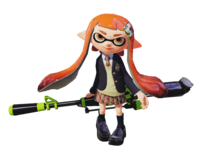 She appears to be based on the female Inkling most commonly used to advertise the game, such as on the front cover and for commercials, along with the default girl Inkling. A recolored version of the Inkling Girl amiibo was released on 8 July 2016. Its functionality is identical to the original, but the character's in-game appearance matches the new model. The recolored Inkling Girl's skin color remains unchanged, but her tentacles are lime green and her eyes are magenta. She wears the Fake Contacts, the Black Tee, and the Black Trainers and carries the Tentatek Splattershot. Octotrooper Hideout Lair of the Octoballs Rise of the Octocopters The Mighty Octostomp! Floating Sponge Garden Propeller Lift Playground Spreader Splatfest The Dreaded Octonozzle! Shifting Splatforms Octoling Assault Undeniable Flying Object The Rampaging Octowhirl! Propeller-Lift Fortress Octosniper Ramparts Octoling Uprising The Ravenous Octomaw! Spongy Observatory Far-Flung Flooders Unavoidable Flying Object Enter the Octobot King! The Inkling Boy amiibo was released on 29 May 2015 along with Splatoon. It can be used to unlock 20 Roller challenges in Octo Valley and provides the player with an exclusive character piece after every four challenges completed. 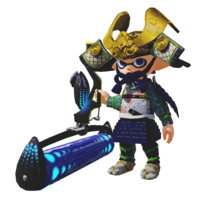 After completing all challenges, the player completes the set and receives the exclusive Samurai Gear along with the Squid Racer minigame and the Hero Roller Replica blueprints. It can be purchased individually or in a pack of three with the Inkling Girl and Inkling Squid amiibo in North America. The original Inkling Boy amiibo is a light-skinned (the third from the left skin tone in Splatoon 2) Inkling with dark blue tentacles and blue eyes. He wears the Fake Contacts, Zink Layered LS, and Purple Hi-Horses and carries the Splattershot. He appears to be based on the male Inkling most commonly used to advertise the game, such as on the front cover and for commercials, along with the default boy Inkling. A recolored version of the Inkling Boy amiibo was released on 8 July 2016. Its functionality is identical to the original, but the character's in-game appearance matches the new model. The recolored Inkling Boy has dark skin, purple tentacles, and orange eyes. He wears the Fake Contacts, the Choco Layered LS, and the Gold Hi-Horses and carries the Tentatek Splattershot. Gusher Gauntlet Octoling Invasion Unidentified Flying Object The Dreaded Octonozzle! Inkrail Skyscape Inkvisible Avenues Flooder Junkyard The Rampaging Octowhirl! Spinning Spreaders Tumbling Splatforms Unwelcome Flying Object The Ravenous Octomaw! Splat-Switch Revolution Pinwheel Power Plant Octoling Onslaught Enter the Octobot King! The Inkling Squid amiibo was released on 29 May 2015. It can be used to unlock sixteen Kraken and four limited-ink challenges, and shooter challenges in Octo Valley and provides the player with an exclusive costume piece after every four challenges completed. After completing all the challenges, the player completew the set and receivew the exclusive Power Gear along with the Squid Beatz minigame and the Hero Shot Replica blueprints. It is available exclusively for purchase in a pack of three with the Inkling Girl and Inkling Boy amiibo in North America, and exclusively in a bundle with the main game in Europe. The original Inkling Squid amiibo is a green Inkling in squid form. A recolored version of the Inkling Squid amiibo was released on 8 July 2016. Its functionality is identical to the original, but the character's in-game appearance matches the new model. The recolored Inkling Squid is orange. Gusher Gauntlet Floating Sponge Garden Spreader Splatfest The Dreaded Octonozzle! Inkvisible Avenues Flooder Junkyard Shifting Splatforms The Rampaging Octowhirl! Spinning Spreaders Tumbling Splatforms Octoling Uprising The Ravenous Octomaw! Spongy Observatory Pinwheel Power Plant Far-Flung Flooders Enter the Octobot King! Amiibo figurines of Callie and Marie were released on 8 July 2016. They can be used to unlock exclusive in-game Squid Sisters concerts, including two exclusive solo songs; one for each sister. Using either of the Squid Sisters causes the Plaza to take on its appearance during a Splatfest, and the player becomes colored after, and wearing a Splatfest Tee for, whichever Squid Sister was used. During the concert, no buildings can be entered, nor can Judd be talked to. The Inkling Boy, Inkling Girl and Inkling Squid amiibo can be used in Splatoon, which will identify them as their original counterparts (and will appear with the original iteration's color rather than the color of the amiibo). The Pearl, Marina, Octoling Boy, Octoling Girl and Octoling Octopus amiibo are not identified by Splatoon, and are treated like non-Splatoon amiibo. The Super Smash Bros. 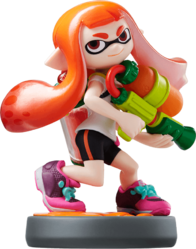 Ultimate Inkling amiibo can be used in Splatoon, which identifies it as the original series Inkling Girl amiibo. amiibo in Splatoon 2 can save full equipment sets for quick selection in matches. The player’s control settings (motion controls and sensitivity settings) are saved as well. They can also be used as in-game friends and players can take pictures with them. When taking pictures with the various Inkling Girl and Boy amiibo, the player can choose if they will wear their original outfit or the gear saved to the amiibo. Upon registering the amiibo, it will ask to befriend the player, who will receive the first gift from the amiibo - a piece of Headgear. Ten victories are needed to unlock the next reward. Saving to the amiibo in the gear selection screen grants the player all the rewards and the ability to immediately switch to the gear and weapon they had equipped while saving. The new Inkling Girl amiibo was released on 21 July 2017 alongside Splatoon 2. It can be purchased individually or in a pack of three with the new Inkling Boy and Inkling Squid amiibo in North America. The new Inkling Boy amiibo was released on 21 July 2017 alongside Splatoon 2. It can be purchased individually or in a pack of three with the new Inkling Girl and new Inkling Squid amiibo in North America. The new Inkling Squid amiibo was released on 21 July 2017 alongside Splatoon 2. It can be purchased individually or in a pack of three with the new Inkling Girl and new Inkling Boy amiibo in North America. Unlike the Inkling Boy and Girl amiibo, players cannot take photos with gear saved onto it. On 11 February 2018, amiibo figures for Off the Hook were announced. 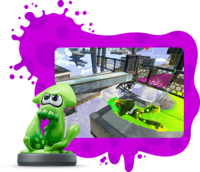 Like the other amiibo, the player is able to befriend them, take photos with them, and receive special gear, specifically the outfits that they wear during the Octo Expansion. They were released on 13 July 2018 sold in a two-pack for $24.99 in the US. Each amiibo unlocks a theme for Squid Beatz 2 which changes the visuals of the game, as well as the sound effects played when entering the button prompts in the game. When taking photos with Pearl and Marina, the player can choose if they will be dressed in their normal outfits or their Octo Expansion outfits (as MC.Princess and DJ_Hyperfresh, respectively). If the amiibo are used during a Splatfest, the player is able to take a photo on-stage with Off the Hook. The Octoling Girl amiibo was released on 7 November 2018 in Japan and Europe, on 9 November 2018 in Oceania, and on 7 December 2018 in North America. It was released as a three-pack along with the Octoling Boy and Octoling Octopus, as well as separately. Unlike the other standard Splatoon amiibo, it, the Octoling Boy, and the Octoling Octopus all have the same colored ink. The Octoling Girl is slightly tan with orange eyes and with two pink tentacles parted and two shorter ones curled up. She wears the Agent 8 outfit from the Octo Expansion along with the unique backpack-like ink tank, and poses with an E-liter 4K. Her knelt-down stance is the same one used in promo images with the Octoling Boy, although instead of looking straight at the screen, she is looking to the side. The Octoling Boy amiibo was released on 7 November 2018 in Japan and Europe, on 9 November 2018 in Oceania, and on 7 December 2018 in North America. It was released as a three-pack along with the Octoling Girl and Octoling Octopus as well as separately. Unlike the other standard Splatoon amiibo, it, the Octoling Girl, and the Octoling Octopus have the same colored ink. The Octoling Boy has pale skin with green eyes and has a pink shaved head with a tentacle Mohawk. He wears his Agent 8 outfit from the Octo Expansion along with the unique backpack-like ink tank and he poses with an Octobrush. His squatted stance is the same one used in a promo image with his girl counterpart, although instead of looking straight at the screen, he is looking at the side. The Octoling Octopus amiibo was released on 7 November 2018 in Japan and Europe, on 9 November 2018 in Oceania, and on 7 December 2018 in North America. It was released as a three-pack along with the Octoling Girl and Octoling boy as well as separately. Unlike the other standard Splatoon amiibo, it, the Octoling Girl, and the Octoling Boy have the same colored ink. The Octoling Octopus is the Octolings' octopus form jumping up with a splash of pink ink, with its main tentacles crossed and having ring-like spots on the end. A notable difference with the squid amiibo are that its eyes are separated and look to the side instead of looking up. Nintendo has released two Splatoon-themed dioramas to display amiibo. One is based on Kelp Dome and another is based on a Squid Sisters concert. Both are foldable and the Squid Sisters diorama includes a hole to slot a 3DS or phone to display a Squid Sisters concert. They both come with stickers and are currently exclusive to Japan. As part of an update for Animal Crossing: New Leaf, amiibo compatibility was added, which includes Splatoon amiibo as well. At a certain point, the player will find a magic lamp that will allow them to summon Wisp once a day. When summoning Wisp, the player can tap a compatible amiibo for him to take the form of the villager it is associated with. The player can either ask for an item or for the real villager to show up at the Campground area. There, the villager will be waiting for the player in an RV. Inside, the player can ask the villager to move into their town, as well as order furniture using MEOW coupons. Tapping the Callie amiibo will summon Cece the squirrel. The Marie amiibo summons Viché the squirrel. Both variants of the Inkling Boy, Girl, and Squid amiibo summon Inkwell the octopus. Each villager comes with their own Splatoon-themed items to order as well. The Switch version of Bayonetta 2 is compatible with amiibo, where the Splatoon series amiibo can be used to gain some items. A special message is also displayed stating: "Here's a present from the kids in Inkopolis. Or are they squids? Whatever. Always wanted to check out their turf. They've got a fresh weaponsmith I wanna talk shop with. Maybe grab myself an N-Zap." In Captain Toad: Treasure Tracker, the Splatoon amiibo figures can be used to gain a 1-Up Mushroom. Most of the other amiibo figures can be used for this as well, however. In Chibi Robo! Zip-Lash, tapping any amiibo except the Chibi Robo amiibo gives the player in-game coins. Tapping the Inkling Girl, Boy, and Squid amiibo will also add special figures of Chibi Robo posing as their respective characters that can be collected via the in-game capsule machine. The Splatoon amiibo figures can be tapped once a day in Hyrule Warriors for a weapon rated three stars or lower, a Rupee bonus, or a crafting material bonus. Most of the other amiibo figures can be used for this as well, however. Kirby: Planet Robobot includes an amiibo feature that grants Kirby a copy ability depending on the character. The Inkling Boy, Girl, and Squid all grant access to the Poison ability for Kirby. In Kirby Star Allies, the Splatoon amiibo are compatible, where they can be scanned in during a stage and give items such as healing items and Picture Pieces. In Mario Kart 8 Deluxe, there are racing suits that be unlocked for the Mii characters. Scanning the Splatoon amiibo figures gives a Splatoon-themed racing suit. The Splatoon amiibo figures can be tapped in Mario Party 10 for a Scratch Bonus and Mario Party Points. Most of the other amiibo figures can be used for this as well, however. The Splatoon amiibo figures can be used in Miitopia to unlock costumes based on their characters. In Mini Mario & Friends: amiibo Challenge, any Splatoon amiibo figure can be used to start the game. This is the same for all other amiibo, though. However, certain amiibo from the Super Mario series unlock extra stages and have special abilities as well. In the Western version of Nintendo Presents: New Style Boutique 2 - Fashion Forward (released in North America as Style Savvy: Fashion Forward), players are able to scan the Inkling Girl amiibo to unlock a pair of leggings inspired by Splatoon. After the amiibo is scanned, a customer will show up at the player's store asking for a new outfit that goes with their Inky Leggings. If the player encourages the customer to try on their outfit (as opposed to just taking a look) and it is to their liking, then a pair of the leggings will be given to the player as a reward. In Nintendo Presents: New Style Boutique 3 - Styling Star (released in North America as Style Savvy: Styling Star), tapping any Splatoon amiibo figure will unlock a pattern based on the Splatoon series. The Splatoon amiibo figures can be tapped once a day in Pokkén Tournament for an avatar costume item, a title, or a Poké Gold bonus. Up to five amiibo rewards can be claimed per day. Most of the other amiibo figures can be used for this as well, however. Super Mario Maker features Mario skins of numerous Nintendo characters through amiibo. Splatoon amiibo grant the player with a costume resembling the scanned character. The Inkling Squid can assume humanoid form and is revealed to be a dark-skinned male with a Splat Roller, the Studio Headphones, the White Layered LS, and what appears to be the Cream Basics. The Callie and Marie costumes can alternatively be unlocked by playing a certain Event Course. When playing in an underwater level, all the amiibo costumes swim in squid form. Amiibo can be scanned into Super Smash Bros. Ultimate, where the Inkling Girl, Boy and Squid amiibo are able to become Figure Players that are saved onto the amiibo. Other Splatoon amiibo grant the player Spirits based on the scanned character. In Word Puzzles by POWGI, scanning in any amiibo generates a word puzzle based on the owner’s Mii name and the nickname of the amiibo. Yoshi's Woolly World features Yoshi patterns based on numerous Nintendo characters through amiibo. Splatoon amiibo grant the player with a pattern resembling the scanned character. Like the Wii U original, Poochy & Yoshi's Woolly World features Yoshi patterns based on Nintendo characters through amiibo. All Splatoon amiibo, including Callie, Marie, and the Inkling recolors, grant the player with a pattern resembling that character. The Inkopolis Plaza out of bounds glitch reveals that the back of the amiibo case at the southeastern corner does have a texture and looks like the back of real amiibo packaging, except the words are written in Inkling. The back of the amiibo case in Splatoon 2 is also written in Inkling. 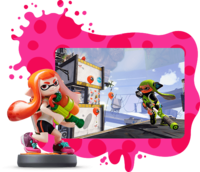 The Inkling Girl's amiibo is the basis for its trophies in Super Smash Bros. for Nintendo 3DS and Wii U. When the Off the Hook amiibo were scanned during the Trick vs. Treat Splatfest, the colors of their outfits were swapped (black for Pearl, white for Marina), the same as their in-game counterparts, except for their original colour scheme (pink for Pearl, teal for Marina). Same goes when scanning during the Fam vs. Friend Splatfest, which their outfits match their in-game counterparts (gold for Pearl, silver for Marina). The recolored Inkling Boy from Splatoon appears to have a different eye color, being green instead of orange, and has a slightly lighter skin tone when scanned into Splatoon 2 compared to its appearance in Splatoon and the amiibo itself. The Octoling Girl amiibo has darker skin in game than her amiibo. In Mario Kart 8 Deluxe, the Inkling Girl and Inkling Boy characters' appearances are based on their amiibo counterparts from Splatoon, including the recolors. This page was last edited on 15 April 2019, at 19:46. This page has been accessed 267,085 times.